Getting a fair copier lease isn’t always easy. There are a lot of salespeople that seem to be telling the truth, but will swindle you in the end. We see this far too often when talking with prospective clients. They signed a lease that looked good on paper until they got tricked later on. We operate differently here at NYC Copier because we believe in providing fair copier leases to every business. Our approach at NYC Copier is to always put the customer first. We don’t use aggressive sales tactics and we don’t believe in tricky leases. You shouldn’t have to be a lawyer just to feel good that you didn’t get ripped off. Our fair leases are based on the idea that you should know what you are signing up for. We would always be happy to breakdown all the prices you are paying and show you exactly what you get. Our prices may look higher at first glance, but you can be sure that they are fair and honest. No tricks. 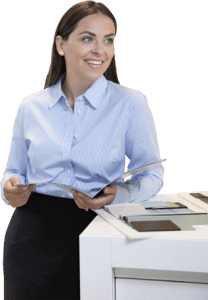 Another way that we promote the idea of fair copier leases in the NYC area is to let new customers bring in copies of their old leases. We can look through your old lease together and point out areas where you may have agreed to a less-than-great deal. Don’t waste your time dealing with horrible copier leasing companies. Come see our expert staff and we can help you get a fair copier lease in NYC.